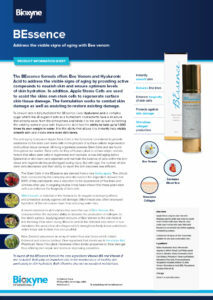 A powerful and natural combination to reduce the appearance of fine lines and wrinkles. BEssence uses the antiageing properties such as Bee Venom, Hyaluronic Acid, Collagen Peptides, Stem Cell Extract, Harakeke Flax Gel and a whole host of other ingredients, which have been added to provide support for your skin. The cosmetic scientists that formed this unique anti-ageing product chose ingredients from around the world, all chosen because they have be proven to work in the area of skin structure improvements. The combination of ingredients in Stem Cell Essence restores collagen leaving your skin looking plump and moisturised. Does Bee Venom really work? YES,… In trials involving 14 women aged between 50 and 59, all the volunteers said the bee venom cream improved the texture of their skin, reduced lines and wrinkles and left them appearing ‘visibly more youthful’. How does Bee Venom work? Honeybee venom is used cosmetically to ‘fool’ the skin into thinking it has been lightly stung with the toxin called melittin, which is found in New Zealand bee venom. This causes the body to direct blood towards the area and stimulates the production of the naturally-occurring chemicals collagen and elastin. Do Swiss apple stem cells really work? Journal Of Applied Sciences, Swiss scientists found that these rare apples have especially long-living tissue stem cells. a staggering 80 percent. The human cells were irradiated with UV light, which killed 50 percent of those grown in a normal liquid culture, but hardly any of those protected by the apple stem cells. Also, hair follicles kept in a solution of Swiss apple stem cells continued to grow for 18 days, while those kept in a typical solution all died after 14. How do Swiss apple stem cells work? and make skin look younger. We know that human stem cells can turn into any part of the body but the law bans the use of human stem cells in cosmetics. So, instead, researchers turned their attention to plants. Plants also produce stem cells throughout their lives, both to grow, as a response to an injury.